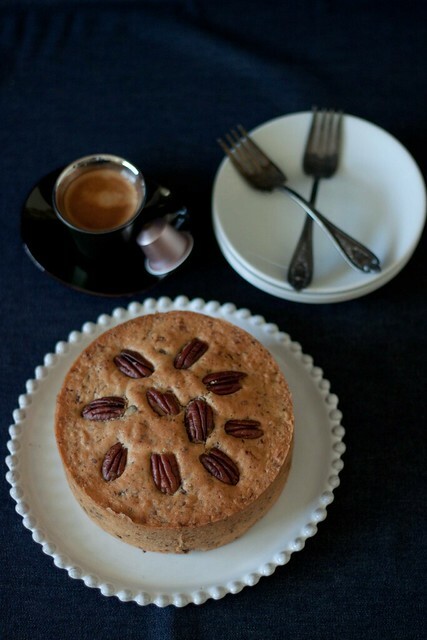 køkken69: Pecan Cake & Best Wishes! 2011 would not have been the same for me without Køkken69 and all the lovely acquaintances and friends I have met here. Despite my crazy travel work schedule, I am suprised that I have pressed on and this space has sustained. Looking back, I want to believe that I have continued to improve in what I am doing here and am thankful for all the silent and not-so silent visitors who continue to grace this space. 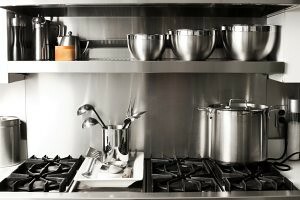 Thank you for trying out the recipes published here. The greatest joy I derive out of this space is when I receive excited feeedback for the recipes. Knowing that my posts managed to inspire is priceless! I leave you with this very humble and down to earth Pecan Cake adapted from Alex Goh's Walnut Cake Recipe in Creative Making Of Cakes. Happy New Year and may we all have many many reasons to rejoice and celebrate in the new year! 2. Add (B) to (A) and mix until light and smooth. 3. In a separate clean mixing bowl, whip (C) until stiff peaks are formed. 4. Fold meringue into butter and egg yolk mixture (2) until well combined. 5. Sift (D) into batter and fold until well combined. Add (E) and mix until well incorporated. 6. Pour batter into lined baking tin and sprinkle with some pecan nuts on top for decoration. Bake cake at 180C for 50mins or test until skewer comes out clean. Wishing you and family a Happy 2012! Thanks Shirley for sharing all the recipes too! Err did u use an 8 inch round tin for the pecan cake? Happy New Year 2012 Shirley! Looking forward more nice foods from your blog in 2012. Gorgeous and elegant looking cake! Happy new year! The cake looks really super and loaded with pecans. Thank YOU for all the inspiration Shirley. I am glad I get to know you through this space of yours. :) Looking forward to another great year of 2012 of cooking and baking!!! Happy New Year! Happy New Year to u Shirley! hv a blessed one and keep up the good work! Your photos only get better and better ..so much so now maybe they can't? They are perfect..Congatulations! It's such a lovely tall pecan cake! I would have loved this too! Happy 2012, Shirley! Hope to see more of your lovely bakes and pictures in the new year! a wonderful cake to welcome the new year! happy new year to you and may it be a fruitful year with more baking & cooking! have fun! thank YOU for sharing all your recipes with us! have a great year ahead! i can just imagine the wonderful smell of toasted pecans! looks like a great cake, shirley! Gorgeous! I love the height of your cake...love tall cakes. Walnuts instead of pecans? Thanks a lot. Happy New Year Shirley. Great blog! Keep it up! I love the look of pecans on the cake and that slice looks absolutely soft and moist! 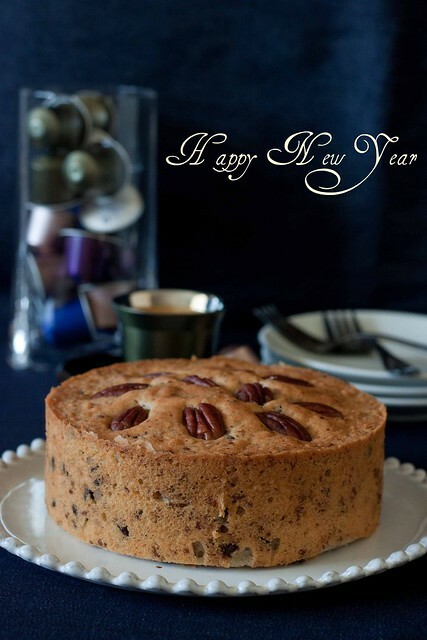 Pecan cake is a "holiday" cake and how nice to start the new year with this. The cake looks awesome ! Wishing you a very Happy New Year. Happy New Year Shirley and all the best to you. 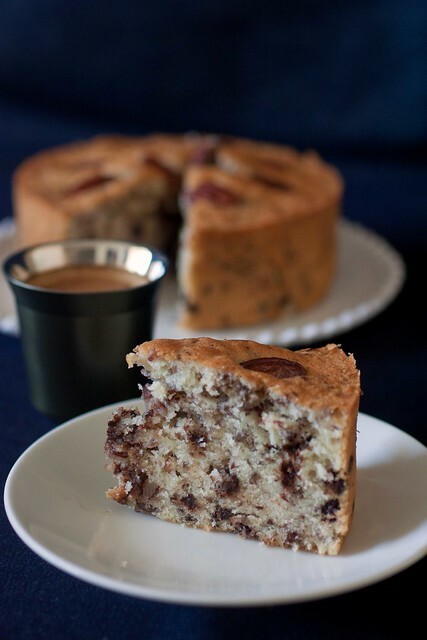 I have not tried a pecan cake before (walnut yes ...) but I am sure it is delicious. It looks amazingly good from the pics. This cake is so beautifully baked. Happy New Year to you, Shirley. happy New year Shirley! All the best and I hope to see more yummy dishes from you! Oh, man! My mom made these amazing pecan cupcakes with caramel icing over the holidays and I've been searching for something similar since then. This is definitely going to be baking in my oven this week. Can't wait!